A replica of the Rialto Bridge in Venezia, Italy outside The Venetian Resort Hotel Casino in Las Vegas. 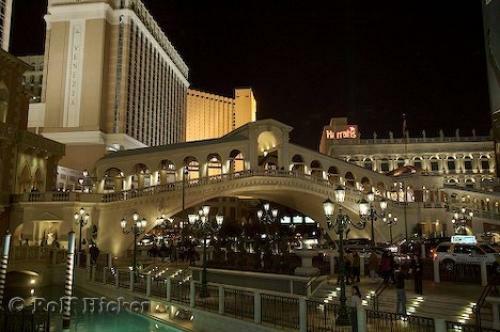 Photo of the Venetian Hotel and Casino in Las Vegas, Nevada with a duplicate of the Rialto Bridge that is in Venezia, Italy. ... The accommodations at the Venetian Hotel are exquisite and the hospitality and service are outstanding. Truly a beautiful hotel to stay at while you are in Las Vegas, Nevada or would that be Venezia, Italy?Gondola Ride, Grand Canal, The Venetian Resort Hotel Casino, Vegas Strip, Las Vegas, Nevada, USA, North America. I photographed this photo with the digital SLR camera model Canon EOS-1DS, aperture of f/4.0, exposure time of 1/10 sec. on ISO 400, as always I used a original Canon Lens, the focus lenght for this picture was 28mm.